When Washington instructed the Environmental Protection Agency (EPA) and National Highway Traffic Safety Administration (NHTSA) to develop new standards focused on fuel-efficiency and greenhouse gas reduction by March 31, 2016, pressure was put on commercial truck dealerships to provide the most fuel-efficient semi-truck possible. These new fuel requirements for commercial trucks will lower costs at the pump and reduce the need for foreign oil. However, meeting these requirements is easier said than done. The first phase of fuel-efficiency requirements for medium and heavy duty trucks stated that these trucks must lessen their fuel consumption between 10 and 20 percent, depending on the size of the truck. On-highway trucks were required to reduce their fuel consumption by 20 percent, while medium duty trucks were required to reduce their fuel consumption by 10 percent. These regulations will affect 2014 to 2018 commercial truck models (Source: Daily Tech). 2018. The goal of GHG14 is to address global climate change and reduce oil consumption. Individual certification is required for the chassis, engine, and A/C system and separate standards have been issues for CO2, N2O, CH4 and HFC’s. Truck manufacturers such as Freightliner already certified its 2013 vehicle fleet one year early – leading the industry. Up and coming engine technologies focused on fuel economy would also help manufacturers in their quest to produce the most fuel-efficient semi-truck. These new engines will note the speed at which the engine is most efficient based, and then take into account the load and road conditions. The engine will automatically maintain that speed that allows the truck to reach its peak efficiency (Source: Popular Mechanics). While the mission to create the most fuel-efficient semi-truck is not an easy one, innovations are underway to achieve this goal. Freightliner’s newest on-highway product the Cascadia Evolution is leading the industry with their impressive mpg as Henry Albert demonstrates. Henry is able to achieve mpg ranges on a consistent basis reaching 10+ mpg (running a full load) and making it a reality. The Cascadia Evolution has fuel efficient features such as bumper closure, windshield improvements, elliptical shaped mirrors, hood-to-bumper fill, 20 inch side extenders, and more. 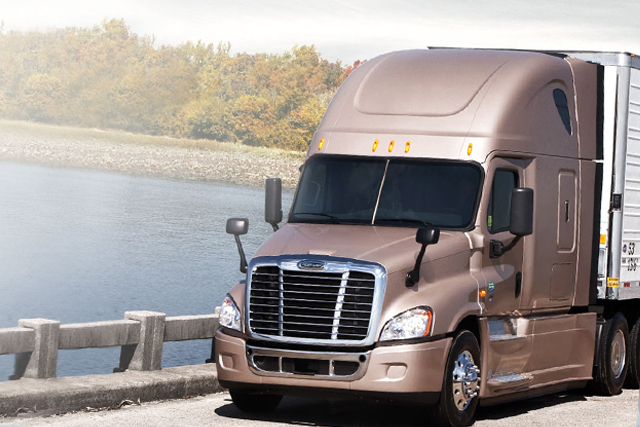 To learn more about Freightliner’s fuel-efficient semi-trucks, contact us.